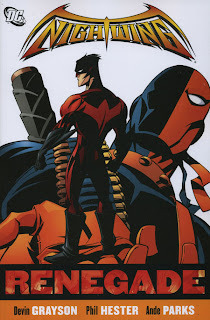 I feel about Nightwing: Renegade basically the same as I did about Nightwing: Mobbed Up: as superheroic mafia crossover fare, this is certainly interesting, readable fare (especially with Phil Hester's art sprinkled throughout). As a Nightwing story, however, this just hasn't been my cup of tea, and mostly I think it comes down to Devin Grayson's portrayal of the main character. Now, that's just an honest difference of opinion, though I'd note that Nightwing's portrayal is considerably more consistent between Outsiders, Teen Titans, Batman, Infinite Crisis and others than it is in Nightwing's own series. And personally, I was quite excited when DC announced that Devin Grayson would be writing Nighwing--we all know she's a fan of the character, and her Titans mini-series and run on the title were brilliant--I still think Grayson wrote the single best issue of No Man's Land in her Leslie Thompkins/Huntress/Mr. Zsasz meeting and frankly, between Gotham Knights and The Titans, Grayson can be credited with bringing character-driven stories back to comics at a time when the pendulum had shifted back the other way--but frankly, between the too-hot-to-handle Tarantula in the previous storyline and the wait-in-need-of-guidance Ravager in this storyline, one begins to worry that the author may be just too invested in her character. Not to mention, the whiny, sarcastic Rose Wilson written here seemed somewhat far afield from what I recall from Teen Titans, or even her recent appearance in Batgirl. So these are quibbles, though it seems like Nightwing may be hard to write all around--the One Year Later creative team that followed Grayson left too--but here's hoping that Marv Wolfman and DC's upcoming big plans for Nightwing can help the title get back on track again.